Captain Marvel (2019) is a forthcoming superhero film based on the character on Marvel Comic, Carol Danvers. Marvel studio is the producer of this movie with Walt Disney as the film distributor. This is considered as the 21st film inside MCU (Marvel Cinematic Universe). The movie is directed and written by Ryan Fleck and Anna Boden whilst the screenplay is written by Jac Schaeffer and Geneva Robertson-Dworet. Captain Marvel is likely going to release on March 8, 2019, a few months before the release of other Marvel’s movie, Avenger 4 which will be released on May 3, 2019. The first official trailer was aired during Monday Night Football on ESPN on December 2019. 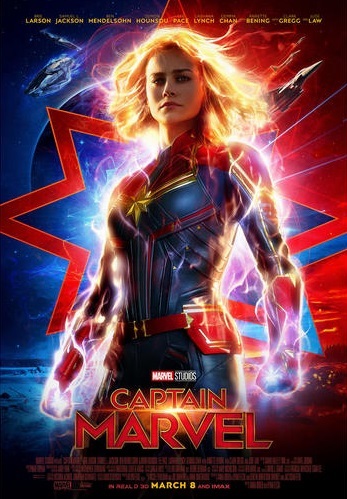 The upcoming Captain Marvel (2019) tells a story of United States Air Force Officer, Carol Danvers who turns out to be Captain Marvel superhero. She is a skilled pilot on earth whilst a force in Starforce space of the alien empire named Kree Empire. Before joining the Starforce, the biology of Carol is melded with the DNA of Kree. It makes her turning out to be a hybrid. She is with memory loss and tries to revive her human legacy. The first appearance of Captain Marvel was set right in 1995. Captain Marvel is also considered as Marvel’s first female-led superhero movie. In fact, the original story borrows Roy Thomas’s comic book element named, Kree Skrull War. Brie Larson was officially announced starring Carol Danvers in the movie. Ryan Fleck and Anna Boden were announced as the directors in 2017. Shooting began in early 2018 on January, and the principal photography began in California and finishing in Louisiana on July 2018. Captain Marvel (2019) is scheduled to be firstly released on March 8, 2019, in the US in 3D and iMax. When it comes to the casts, Brie Larson is chosen to play the lead role of Carol Danvers. She is well-known for her great performance in Room (2016). She has ever played role in comic book movie before starred as Envy Adams in Scott Pilgrim vs. The World (2010). The other casts include Samuel Jackson starring Nick Fury, Clark Gregg starring Phil Coulson, Jude Law starring Yon-Rogg, a bigheaded military officer of Kree and baddie in charge for Carol Danvers turning into Miss Marvel. There are also Lashana Lynch starring Maria Rambeau, Carol’s closest friend in the US Air Force, Ben Mendelsohn starring Talos, the Skrull’s leader who permeate earth with their power of shape-shifting, Djimon Hounshu starring Korath, Lee Pace starring Ronan the accuser, and Gemma Chan starring Minn-Erva, a snipper of Starforce who is jealous to the presence of Carol. Captain Marvel (2019) is called as one of the most expected film in 2019 by IMDb in late December 2018. The film is also considered as the most expected chartbuster movie based on Fandango, a ticketing service. After twenty-four hours of release, the ticket sales ranked on third place on the Fandango, behind Black Panther and Infinity War of Avengers.